I recently had the opportunity to play with Akka FSM at work for some really interesting use-case. The API (in fact, the DSL) is pretty awesome and the entire experience was amazing. Here's my attempt to log my notes on building a Finite State Machine using Akka FSM. As an example, we'll walk through the steps of building an (limited) Coffee vending machine. Why not become and unbecome? We know that the plain vanilla Akka Actors can switch its behavior by using become/unbecome. Then, why do we need Akka FSM? Can't a plain Actor just switch between the States and behave differently? Yes, it could. But while Akka's become and unbecome is most often enough to switch the behavior of Actors with a couple of states involved, building a State Machine with more than a few states quickly makes the code hard to reason with (and even harder to debug). Not surprisingly, the popular recommendation is to switch to Akka FSM if there are more than 2 states in our Actor. To expand on it further, Akka FSM is Akka's approach to building Finite State Machines that simplifies management of behavior of an Actor in various states and transitions between those states. Under the hood, Akka FSM is just a trait that extends Actor. What this FSM trait provides is pure magic - it provides a DSL that wraps a regular Actor enabling us to focus on building the state machine that we have in hand, faster. In other words, our regular Actor has just one receive function and the FSM trait wraps a sophisticated implementation of the receive method which delegates calls to the block of code that handles the data in a particular state. One other good thing I personally noticed is that after writing, the complete FSM Actor still looks clean and easily readable. With any FSM, there are two things involved at any moment in a FSM - the State of the machine at any point in time and the Data that is shared among the states. In Akka FSM, in order to check which is our Data and which are the States, all we need to do is to check its declaration. This simply means that all the States of the FSM extend from the MachineState and the data that is shared between these various States is just MachineData. 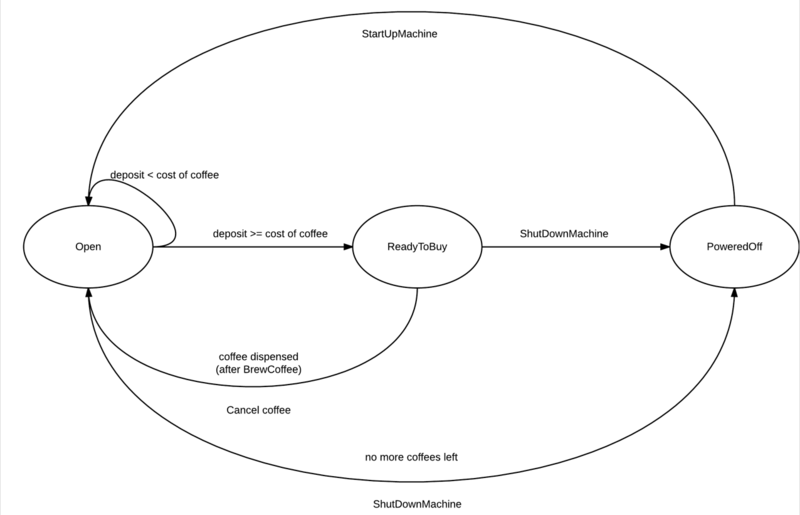 So, as we captured in the State Machine diagram, we have three States - Open, ReadyToBuy and PoweredOff. Our data, the MachineData holds (in reverse order) the numbers of coffees that the vending machine could dispense before it shuts itself down (coffeesLeft), the price of each cup of coffee (costOfCoffee) and finally, the amount deposited by the vending machine user (currentTxTotal) - if it is less than the cost of the coffee, the machine doesn't dispense coffee, if it is more, then we ought to give back the balance cash. That's it. We are done with the States and the Data. Before we go through the implementation of each of the States that the vending machine can be in and the various interactions that the user can have with the machine at a particular State, we'll have a 50,000 feet view of the FSM Actor itself. //fallback handler when an Event is unhandled by none of the States. //Do we need to do something when there is a State change? * `Event`, which allows pattern matching to extract both state and data. Finally, there is an onTransition function which allows you to react or get notified of changes in States. There are two kinds of people who interact with this Vending machine - Coffee drinkers, who need coffee and Vendors, who do the machine's administrative tasks. For sake of organization, I have introduced two traits for all the interactions with the Machine. (Just to refresh, an Interaction/Message is the first element wrapped inside the Event along with the MachineData). In plain old Actor terms, this is equivalent to the message that we send to the Actors. Let's also declare the various interactions that a Vendor can make with the machine. set and get the number of coffee remaining in the machine. query the machine for the cost of the coffee. In the next post, we'll go through each of the States and explore on their interactions (along with testcases) in detail. For the benefit of the impatient, the entire code is available on github.